This interactive map highlights 29 Local Education Agencies (LEAs) out of the 221 LEAs that have participated in the Strengthening Teacher and Leader Effectiveness (STLE) grant program. The program summaries are intended to provide users with insight into how these grantees implemented initiatives to strategically further develop our most important asset in K-12 education, our teachers and principals, so that all students have access to the most effective educators. Click on one of the LEA map points to link to a specific district, or refine your search using the available filters to view a particular selection of LEAs that represent the geographic and demographic diversity in our state. Learn about the various ways in which that specific LEA has leveraged comprehensive systems of educator effectiveness improvement rooted in sound implementation of teacher and principal evaluation. See the specific talent management challenges addressed. See the types of roles and responsibilities developed as part of the teacher and principal career ladder pathways. Read about the initial impact this work has had on students and talent management. Since the summer of 2012, the $83 million in funds under the Strengthening Teacher and Leader Effectiveness (STLE) grant have helped Local Educational Agencies (LEAs) take a comprehensive systems approach to prepare, recruit, develop, retain and provide equitable access to the most effective teachers and principals as part of their implementation of the Annual Professional Performance Review (APPR) system. The Department believes the overall quality of teaching and learning can be raised through the development of comprehensive systems of educator effectiveness improvement that is rooted in sound implementation of the teacher and principal evaluation system. 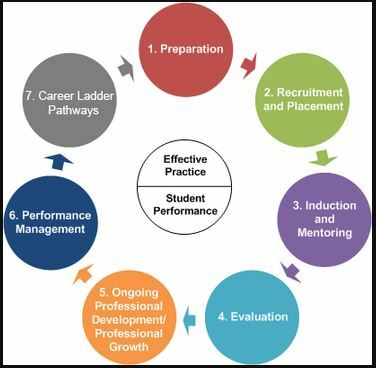 Such systems leverage programs that focus on various elements of a strategically planned Teacher and Leader Effectiveness (TLE) continuum, including preparation, recruitment and placement, induction and mentoring, evaluation, ongoing professional development/professional growth, performance management and career ladder pathways. In doing so, these systems can address common talent management challenges that serve as barriers to student achievement and equal education opportunity. An educator leaders are recognized Effective and Highly Effective teachers and principals that address the emergent needs of students, teachers, and administrators to increase student achievement through established leadership roles that bear additional responsibilities outside traditional requirements. The $83 million Strengthening Teacher and Leader Effectiveness (STLE) grant program has met with great success. Throughout the four grant cohorts (STLE 1, STLE 2, STLE 3, and STLE Dissemination Grant: Principal Leadership), Local Educational Agencies (LEAs), representing approximately one-third of all districts and BOCES in the State, focused on strategically increasing teacher and leader effectiveness. Each lead recipient of the Strengthening Teacher and Leader Effectiveness (STLE) grant submitted a program abstract, summarizing the initiatives that grant funds would support. Details include what student and talent management needs were to be addressed through grant funded activities, specifically describing how high needs students and shortage areas would be affected. Grantees describe the goals and measurable objectives of their unique program, as well as describe how the initiatives fit into a cohesive and comprehensive Teacher and Leader Effectiveness (TLE) system. The Using Evaluation for Improvement: Assessing and Building Capacity webinar is a part of the series of sessions scheduled over the course of the year to support those participating in the STLE-Dissemination Grant: Principal Leadership (STLE-D) program as they work to enhance the implementation of their APPR system. Tools, resources, and concrete examples were provided to help districts move past the traditional post-professional development perception surveys and move to a deep analysis of the impact of professional development efforts on teaching and learning. This Making SLOs Matter: Supporting Meaningful, Rigorous Goal-Setting webinar is a part of the series of sessions scheduled over the course of the year to support those participating in the STLE-Dissemination Grant: Principal Leadership (STLE-D) program as they work to enhance the implementation of their APPR system. Trends and patterns identified through the thorough review of participants’ SLO samples are highlighted, leading to a discussion of misperceptions and common challenges in the development of high quality SLOs. The Sustaining the Reach of Our Most Effective Educators webinar includes information from two local grantees as they share their experiences in working towards sustainability of initiatives post-grant period while also highlighting models, experiences, and reflections from those involved in extending the reach of effective educators across the nation. The Enhancing Family Engagement webinar allowed for the close examination of resources and examples of how districts across New York State, including STLE grantees, are engaging families. This webinar provides districts time to reflect upon current family engagement efforts, identify areas of strength and areas that could be enhanced, and strategically plan possible next steps for strengthening the home-school connection at the district, building, and/or classroom level.